Florida Atlantic University’s Human Powered Submarine (HPS) team won first place for best use of composite materials, third place overall for speed and hold the record for the fastest female pilot at the 12th International Submarine Race (ISR) at the David Taylor Model Basin, Naval Surface Warfare Center Carderock Division (NSWCCD), West Bethesda, Maryland. 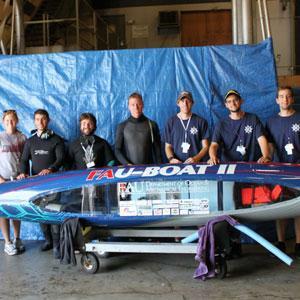 The FAU team entered a two-man propeller driven submarine, FAU-Boat II and a one-man propeller driven submarine, Talon 1. The FAU-Boat II, was designed using the composite material woven basalt mesh, a material made from volcanic rock that was chosen for its strength, performance and ease of use and won the team first place for best use of composite materials. Talon 1, reached a speed of 6.55 knots, making them the third fastest team at the race. JenniferFrame, an ocean engineering student reached a speed of 5.5 knots, earning her the title of fastest female pilot and breaking the previous FAU record of 3.669 knots. The 18-person team made up of all ocean and mechanical engineering students with the exception of Mike Metzger, a business major in FAU’s College of Business, included Frame, Sami Graham, Nick Morley, Chris Nunes, Andrew Spence, Mike Neal, Adrian DeSilva, Omar Ramos, Justin Andrade, Danielle Kolber, Youkendy Mera, Jamani Balderamos, Aya Gare, Joseph Crist, Garret Milanovich, Peter Wicker and Craig Ades. The team also was aided by Edgar An, Ph.D., professor of ocean and mechanical engineering at FAU, and FAU machinist Fred Knapp. “Although we did not come home with the first place prize, the team learned some invaluable lessons and is already gearing up for the next race,” said Metzger. The goal of the race is to design and build a one or two-person underwater vehicle, using the principles of hydrodynamic design, buoyancy, propulsion, guidance systems, underwater life support and systems engineering. The teams race their vehicles using SCUBA equipment in NSWCCD’s 3,200 foot-long model basin. At the end of the week-long competition, the winning teams are recognized for best overall performance, innovation, speed, best use of composite materials and spirit of the race. The 23 teams that participated this year comprised of local and international high school and college studentsfrom the United States, Canada, England, Mexico, the Netherlands, Germany and Oman.